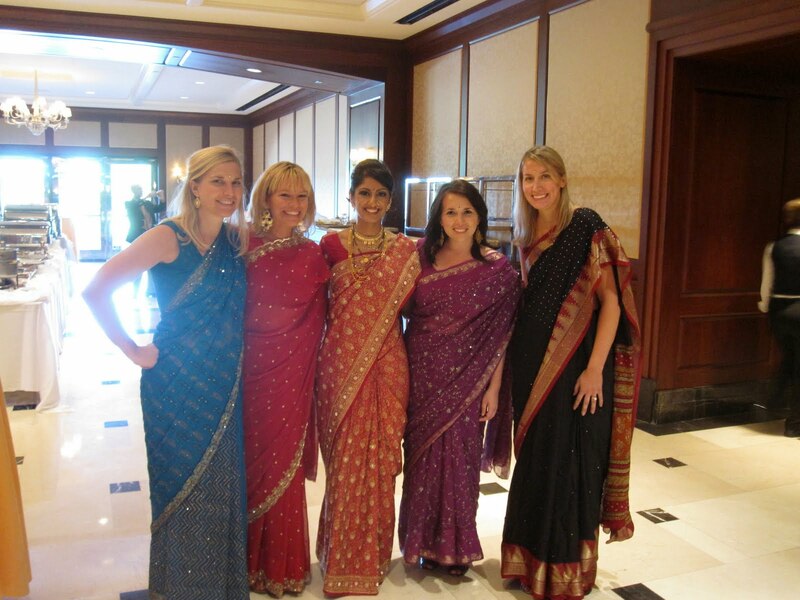 So out sari ladies wrapped, tightened, tucked, and re-wrapped us so we were correctly and beautifully in our saris. I loved the peacock blue of Annie's (and apologize for putting pictures of her at 7:30 AM getting dressed on the inter-webs. Hee). After downing some Starbucks and granola bars, we hopped on the bus to the country club for the procession. We arrived around nine, and waited for the coffee to kick in. . . 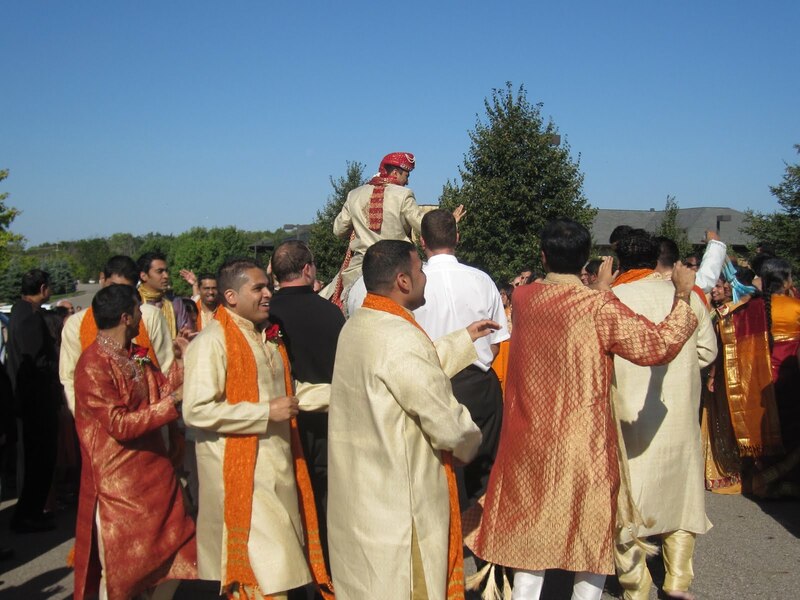 Which it immediately did upon the arrival of Vivek's (the groom) transport. 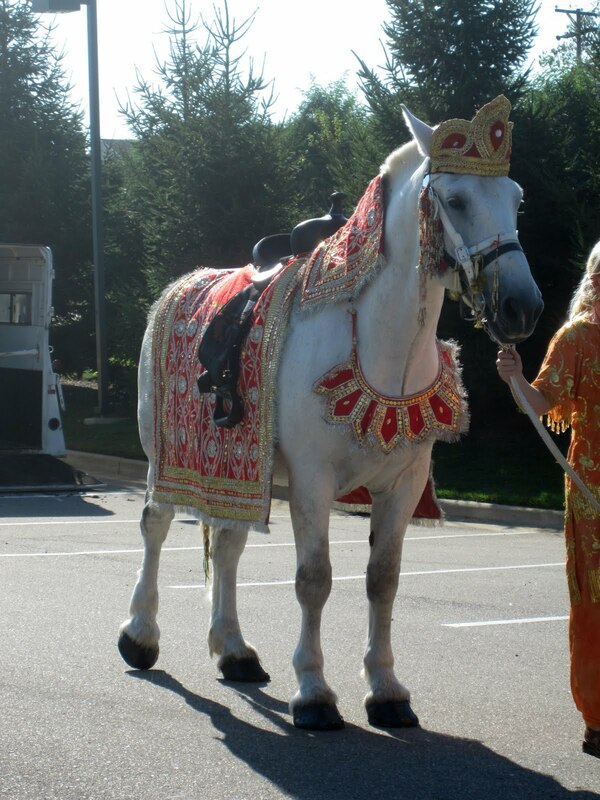 Vivek had never ridden a horse before, so was understandably a bit nervous. I had voted on their wedding website for an elephant to be his transportation, but apparently horse won. Once I saw that braided tail and ornate horse clothes, I was immediately brought back to My Little Ponies, which is always awesome. Vivek's hat is amazing. I think it would have looked lovely on Hubs, so we could have coordinated. 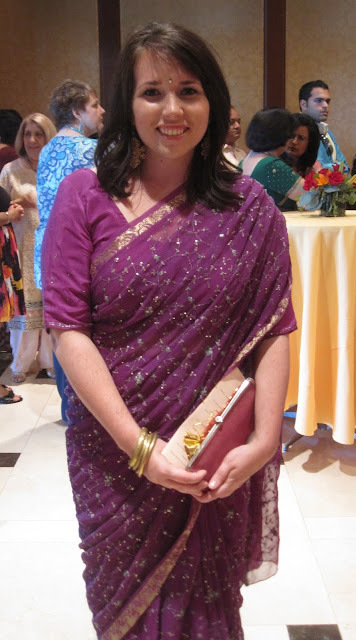 Who has purple heels to match their sari? The breathtaking bride walking down the aisle. 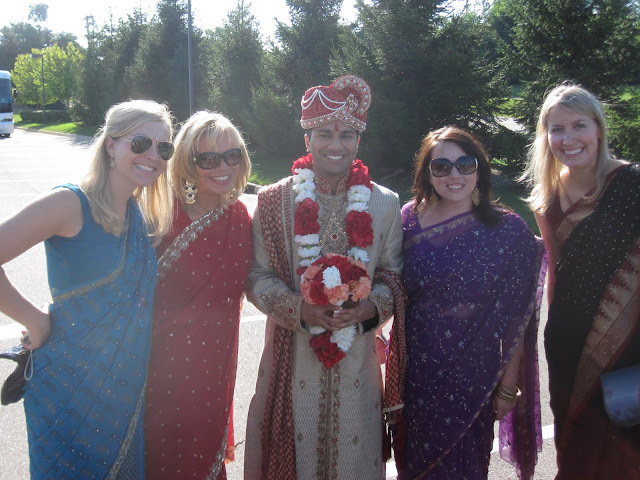 Juhi did such a wonderful job picking out our saris- each one fit our coloring and preferences perfectly. 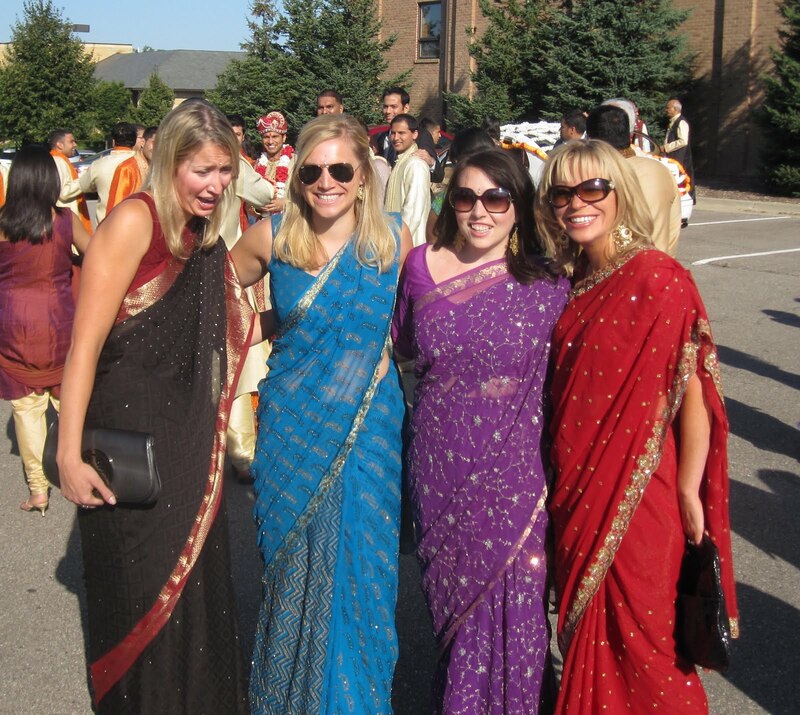 We were all confused when Juhi told us to change into our normal clothes for the reception that evening. What? Saris look so comfy. Hell to the no. I had a massive welt around my waist from my petticoat being tied so tight, then all the pleats were tucked in to the petticoat. I couldn't slump without searing pain shooting through my midsection. Painful but good for posture! Wow - what a gorgeous wedding. The saris are breathtaking! You all looked gorgeous in them. 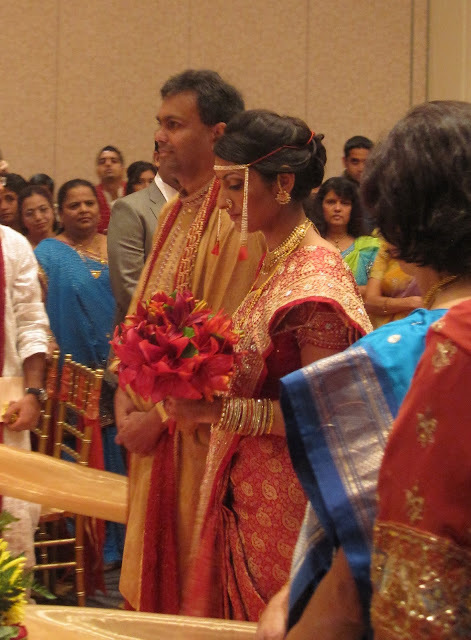 Love how beautifully the bride's flowers matched her sari. Juhi is GORGE! Seriously what a beautiful bride. Beautiful - the bride is stunning and you all look fabulous! I'm still hearting on your haircut!! I think you should change nationalities. You look fantastic. What a wonderful wedding! You all look so cute! I wore a sari in one of my girl friends weddings, and it was so much fun ~ but you're right, not very comfortable!! You look gorgeous in that red! yikes, i didn't know you were taking those. can't wait to wear it again this weekend!! Thanks!Hope you have a wonderful weekend! WOW, you guys look fantastic!!!!!! you all look great. I am sure this will be a wedding you remember for ever. This is amazing - you all look absolutely stunning! The red and gold on you is just perfect, and I'm seriously crushing on your hair! Before and After- house preview! Let's Get to the Good Stuff Shall We?